The banjo derived from stringed instruments played in West Africa and travelled across the Atlantic to America with the slave trade. 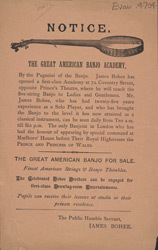 Minstrels and amateur players introduced the instrument to Britain in the 1860s, and although it was originally regarded with contempt by the upper and middle classes, banjo music gradually caught on. The instrument itself became popular as a parlour entertainment for aspiring young women and thousands of pieces of sheet music were published. Banjo teachers were readily available.